It seemed odd that back in May we posted an article that said sentiment data may be suggesting the equity markets were oversold. At that time the equity markets really had not sold off but had pretty much traded sideways around the S&P 500 level of 1,878. What prompted our comment was the fact bullish individual investor sentiment had declined to 28%, which is one standard deviation below its long term average. Since the time the article was published, the S&P 500 Index is up nearly 6%. 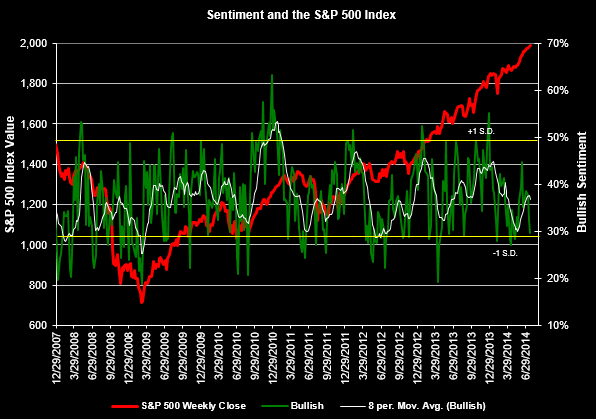 Well, today the American Association of Individual Investors reported their weekly sentiment survey data and the results show individual investor bullish sentiment has once again declined to 29.6%: near the minus one standard deviation below the bullish average. 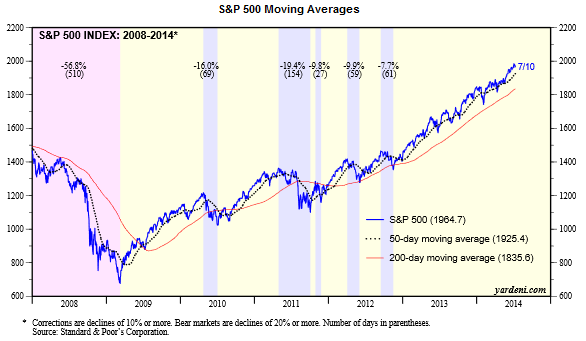 Maybe the equity market is not oversold, but more under owned. 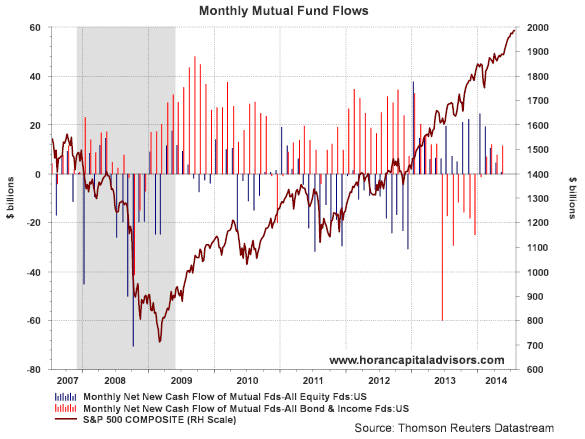 The below chart of monthly mutual fund flows shows fund flows into equity funds is increasing at a decreasing rate. Additionally, the red bars show flows into fixed income funds remain steady and maybe even beginning to increase. This fund flow data seems to be anecdotal evidence that investors do not believe in the sustainability of this equity rally. 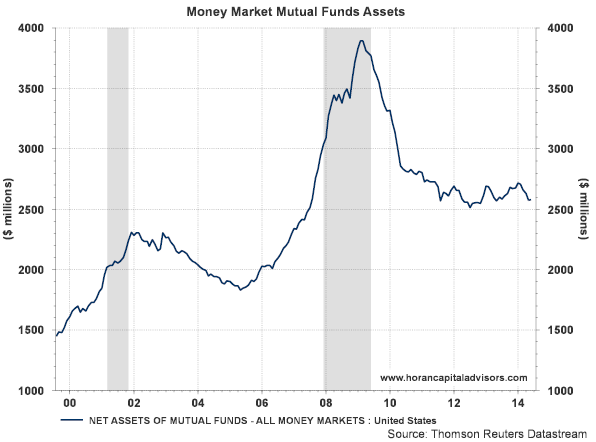 Even the level of assets in money market mutual fund assets has remained relatively steady as noted in the below chart. We have probably stated at ad nauseam, as have many other market prognosticators, that the equity markets seem overdue for a correction. The difficulty with the correction belief is the fact market corrections rarely occur when the majority of investors have this same viewpoint. Investors should use this point in time to evaluate their investment assets to assess where they are over or underweight in certain investments or investment categories. Reducing overweight positions is not necessarily a bad strategy at this point in the market and economic cycle. Reallocating into undervalued segments, even alternative investments that may perform better in a market correction, is not a bad strategy. Investors should keep in mind though that recently reported economic data seems to indicate a pretty good economic climate. Scott Grannis published an article a few days ago noting a number of positive economic data points, Recovery Rests on Solid, not Liquid Ground. It is just possible this market will continue to climb that so-called "wall of worry." This past week was an event filled one as geopolitical concerns rose to the top of investor worries with issues in Ukraine. As Josh Brown noted in an article he posted last week, these geopolitical events seem to be ever present. He noted though, the change this past week was investor awareness became focused on these concerns with the downing of the Malaysian airliner over Ukraine. In spite of this type of headlines news, the S&P 500 Index manged to generate a positive return of .54% for the week. 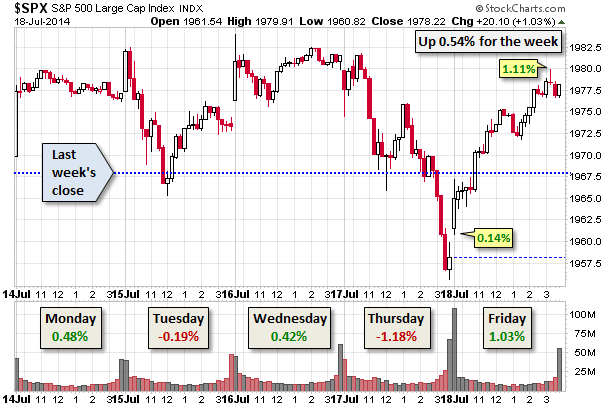 The small cap segment of the market continues to face headwinds and was down .72% last week. 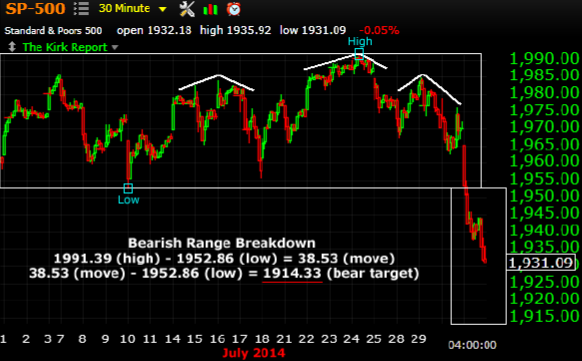 In all, the market does not seem to want to put in a meaningful correction. A correction will occur though and most likely at a time that is least expected. Below is the link to this week's magazine. HORAN Capital Advisors has released its Summer 2014 Investor Letter. The markets have seen synchronized returns in 2014 with almost all major equity classes generating positive returns. Many investors are questioning the ability of the equity markets to display continued strength in light of not having a 10+% correction in over two years. The economy was very weak in the first quarter as measured by the final GDP number, which showed the economy contracting at a 2.9% annual rate. Yet, we believe the first quarter weakness can be mostly related to the extreme winter weather across much of the U.S. The magnitude of the decline surprised many economic forecasters with weakness in the GDP report largely attributable to a weaker inventory build. Our investor letter discuss our views on interest rates as well as economic and corporate financial fundamentals for the balance of 2014. 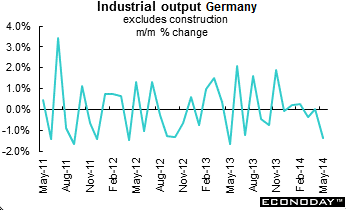 Much of the blame for the slight weakness in U.S equity markets and more significant weakness internationally is being attributed to a weak industrial production report out of Germany, minus 1.8% for May, and concerns about about systemic risks to peripheral Eurozone lenders after Portugal's regulatory agency suspended trading in Banco Espírito Santo Thursday. Market's like Spain and Italy were down over 4% with Germany down 3.4%. The U.S markets seemed to act as though these foreign issues are isolated events. Except for the 4% decline in the Russell 2000 small cap index, the broader S&P 500 Index and Dow Jones Industrial Average were down less than 1% on the week. Also important this week will be a number of earnings reports from financial firms like, Citigroup (C), Goldman Sachs (GS), JP Morgan (JPM). In the technology sector, Intel (INTC), Google (GOOG), and International Busness Machines (IBM) report earnings as well. Posting commentary has been light this past week for a number of reasons; however, topic thoughts often come from interesting articles I read throughout the week. 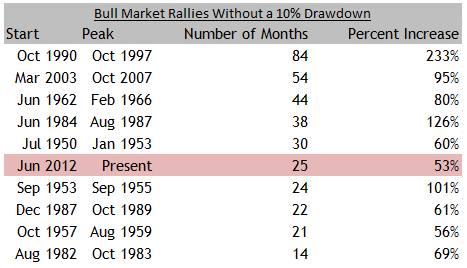 The difficulty of late has to do with the abundant stream of commentary that is predicting the end of this bull market run, i.e., the dreaded 10+% correction which has not been experienced for over two years now. 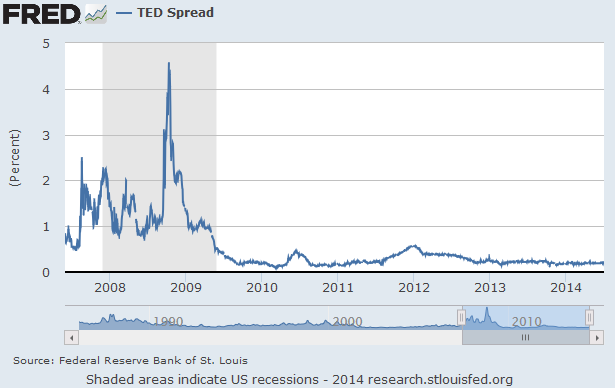 Exacerbating this stream of thought has been the media's effort to stoke fear in investors' minds. This past week CNBC has used its yellow highlight of market indicators to indicate big market down days, yet, on the week, the S&P 500 Index was down only .9%. Given the level of the S&P 500 Index and the Dow Jones Industrial Average, triple digit point declines for the DJIA do not necessarily translate into large percentage declines. I suppose someone will figure out the math behind that eventually. Avondale Asset Management's Chief Investment Officer posted an article early last week noting that the current bull market run in the S&P 500 Index without a 10% correction is the sixth longest ever. As the below chart shows, this bull market run of 25 months can certainly continue for many more months. 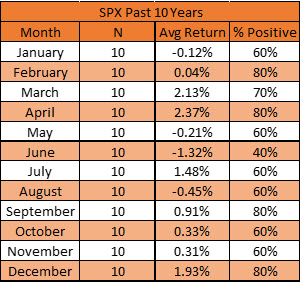 So having commented on the 10% correction fear, is there current data that would be predictive of a market correction. 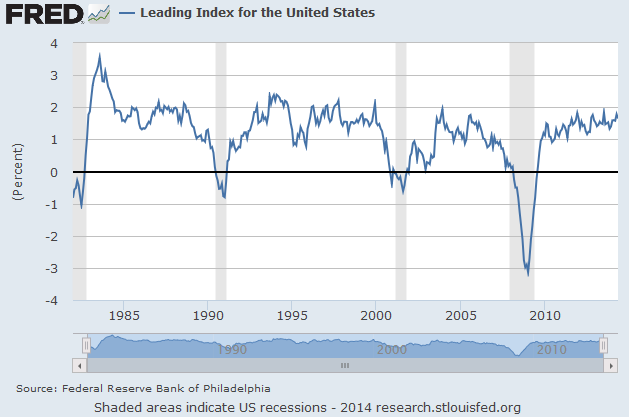 Knowing the economy is not the market, but what does the economic data suggest? 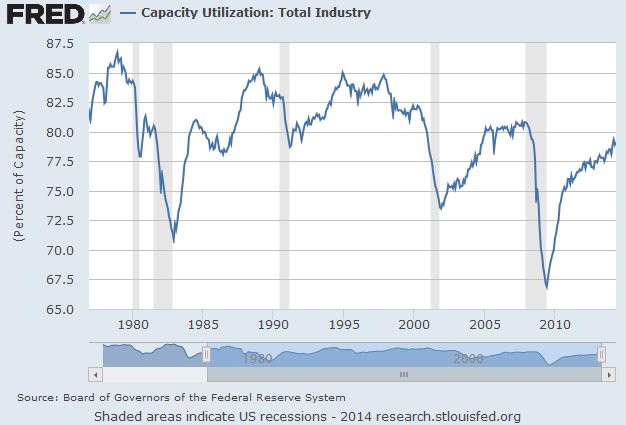 Below is a chart dump of some important economic variables and all of them indicate economic strength. 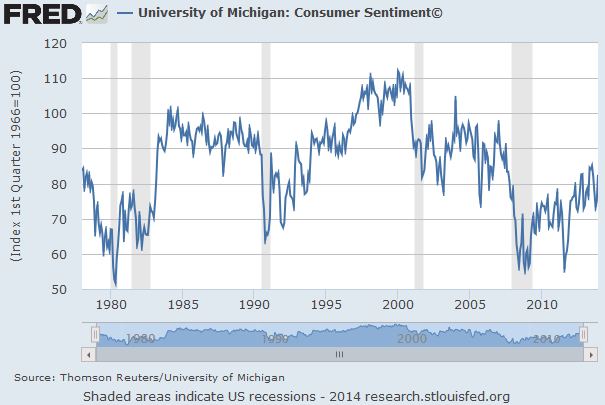 I will say though, the economic data is not supportive of a robust economy, but more of a bump along slow growth one. I will not go into the significance of each one; however, interested readers can read about these indicators in a post we wrote in December of 2009, Key Economic Indicators Suggest The Worst Is Behind Us. 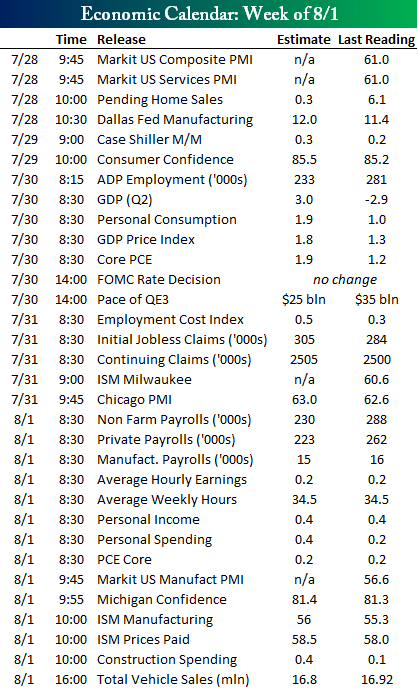 We discussed several other factors in a post earlier this month, What Event Triggers The Next Market Correction, where we noted the improving trend in negative/positive earnings preannouncements, an improving trend in forward earnings growth, underlying strength in the U.S. Manufacturing PMI. 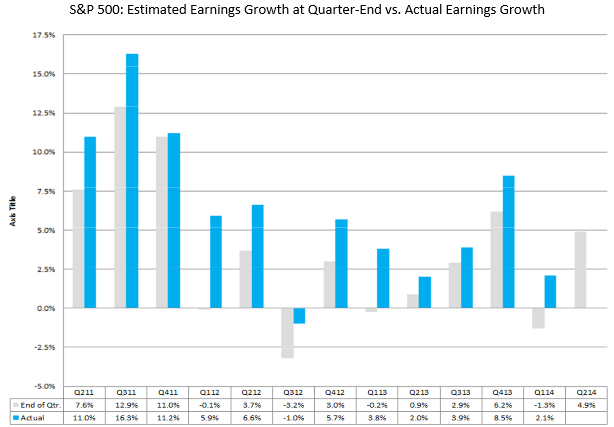 As an update on the earnings front, Factset is showing a mostly improving estimated earnings growth trend for the Q2 2014 time period. 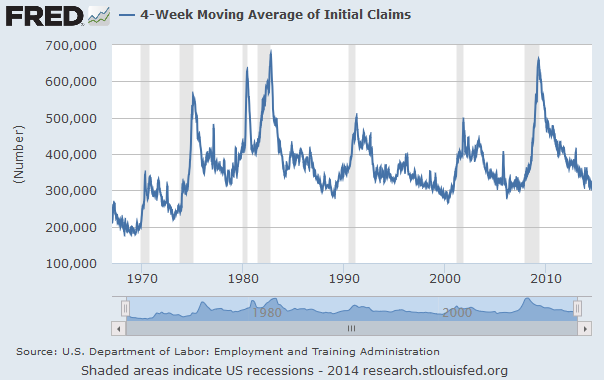 This improving trend has been in place since Q3 2013. And is the market maybe ahead of where earnings suggest it should be? Maybe somewhat. We do believe the market's valuation is slightly above its long-term valuation average, but not wildly overvalued. Additionally, we do know the market does not correct simply because it might be overvalued. Are there things investors should be concerned about? Yes. One is the fact the market will correct. Now is the time to review one's asset allocation and reallocate investments from overweighted positions or categories into underallocated ones. Everything around the globe is not a utopia, there are issues in Ukraine, the Middle East and Portugal, just to name a few. The market does like to climb the proverbial wall of worry. Market stats, like the absence of a 10% correction, are certainly interesting factors to evaluate; however, at the end of the day, "anticipated" economic and corporate fundamentals are important factors to analyze. As Investment Analyst Andrew Thrasher noted in a recent article, Market Stats, Fun Facts, and Why You Can Ignore Them, some of the technical stats are interesting, but investors should use caution in basing their entire market bias on them. 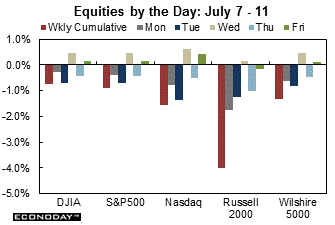 The major U.S. equity indices ended the shortened holiday week last week in the green. The best performing index was The Nasdaq Composite up 2.0%, with the worst performer being the S&P 500 Index up 1.2%. A notably weak sector was utilities (XLU) down over 3%. Consumer discretionary (XLY), health care (XLV) and technology (XLK) were the top performing sectors. Some credit the strength in the equity market to the generally positive economic reports last week. Officially, earnings season kicks off this week with Alcoa's (AA) report after the market close on Tuesday. 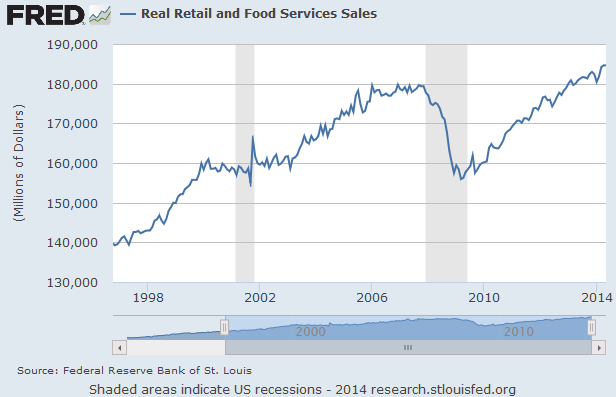 "For the second quarter, the recovery has regained strength across a variety of sectors. 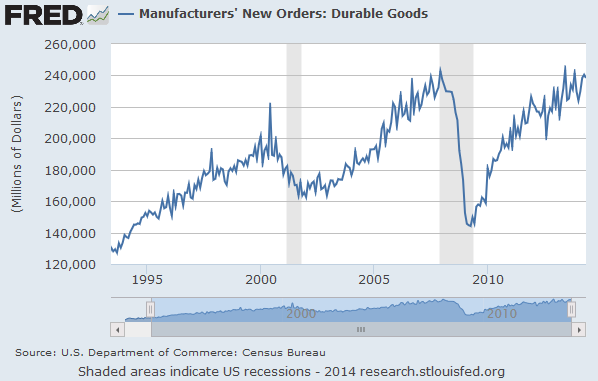 Clearly, the consumer and manufacturing sectors are gaining strength. However, construction is uncertain. 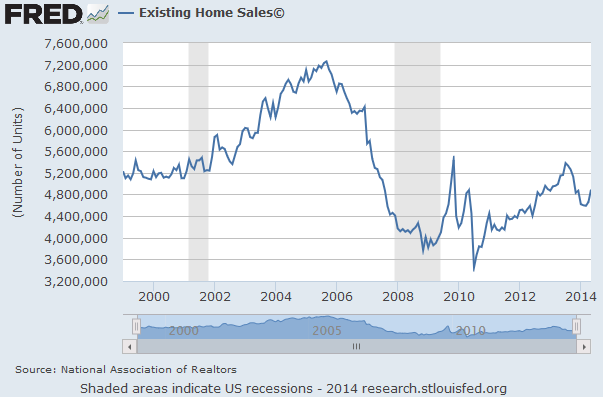 But the latest and positive employment data suggest that there may be better numbers ahead at least for housing. Second quarter GDP growth should be relatively strong." During the month of June the capitalization weighted S&P 500 Index was up 2.07%. The equal weight Guggenheim Index (RSP) returned 2.86%. This equal weight outperformance was also achieved by both the dividend payers and non payers in the S&P 500 Index. In total though it was the non payers that outperformed the payers during June by returning 3.91% versus the payers return of 2.56%. For the last twelve months though, the dividend payers maintain a performance advantage over the non payers, 34.11% versus 32.26%, respectively. This equal weighted outperformance of the payers and non payers over the S&P 500 Index is a phenomenon that is occurring on a longer term basis in the broader equal weighted index as well. As the below chart shows, over the last year the Guggenheim Equal Weight S&P 500 Index (RSP) is outperforming the S&P 500 Index. We discussed this positive equal weight trend in a post last month, Active Share And Equal Weighted Investment Strategies. There is no one variable or silver bullet that will provide insight into the future direction of the stock market or an individual stock. At the end of the day though, a stock's future direction will depend on a company's ability to grow its earnings. We constantly review data, financial and economic, that will provide insight into earnings growth for companies, the overall market and specific countries. With the strength of the markets' advance since the end of the Great Recession, and this improvement seems to be occurring globally as we noted in an earlier post on first half 2014 returns, the question most frequently ask is what derails this uptrend. Aside from the unpredictable black swan type of event, a slowing of growth in corporate earnings on a broad based basis would certainly be a catalyst for an equity market correction. Below are a few earnings related data points that would seem to suggest companies are continuing to see growth though and this growth is occurring at a slowly increasing rate. 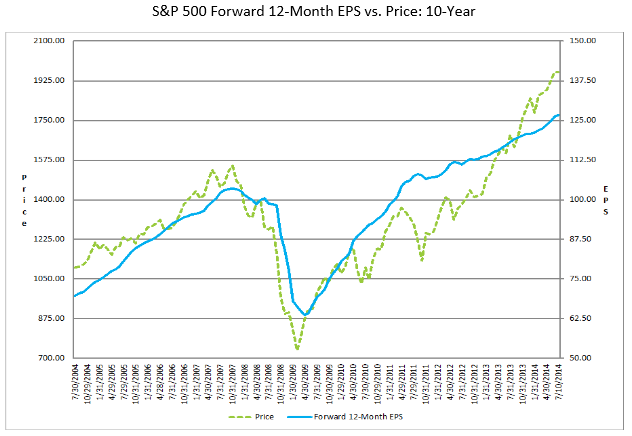 "With earnings season just around the corner, today's chart provides some long-term perspective on the current earnings environment by focusing on 12-month, as reported S&P 500 earnings. Today's chart illustrates how earnings declined over 92% from its Q3 2007 peak to Q1 2009 low which brought inflation-adjusted earnings to near Great Depression lows. Since its Q1 2009 low, S&P 500 earnings have surged to all-time record highs. 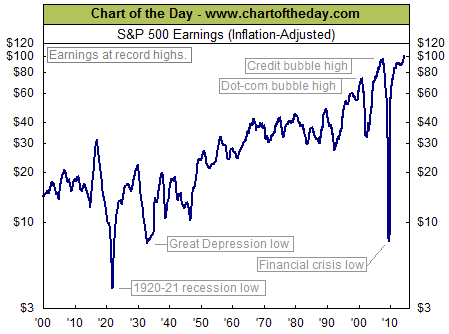 To further illustrate the significance of the current corporate earnings recovery, consider that the run-up in real earnings from Great Depression lows to credit bubble peak took over 74 years. The run-up from financial crisis lows to today has been similar in magnitude (actually slightly more) but was accomplished in a mere five years. 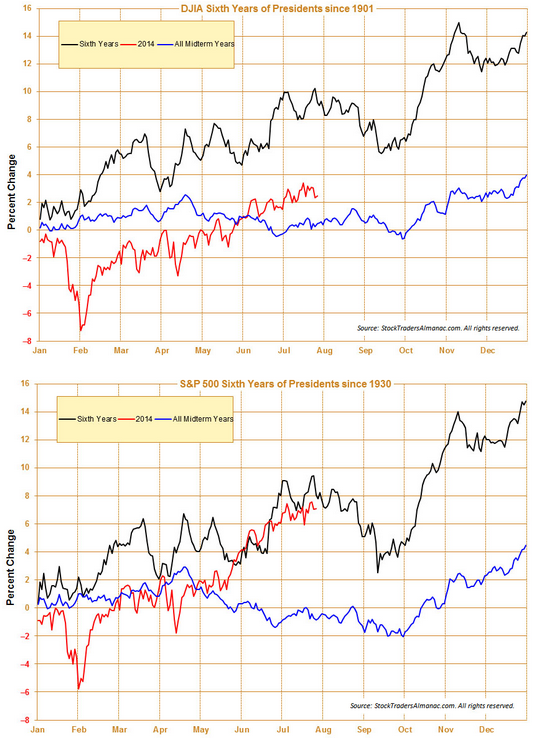 In the end, S&P 500 earnings are currently at all-time record highs." The positive earnings result displayed above is history though. More important is forward earnings growth and we can look at earnings guidance. On that front forward earnings expectations are improving. The below chart notes the severe earnings contraction during the financial crisis and the strong recovery into 2010. More importantly is the IBES forward earnings expectations since mid 2012. 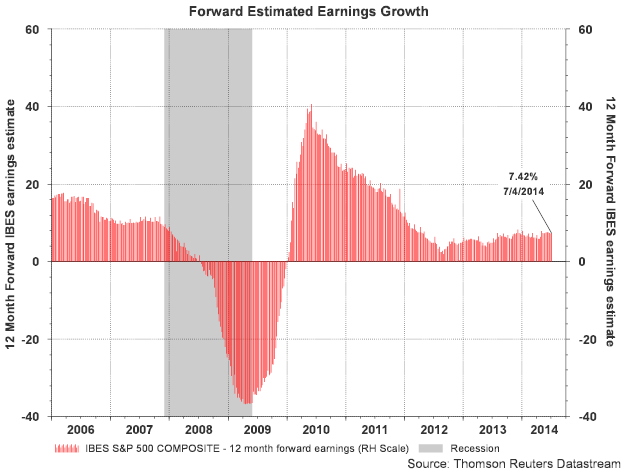 The earnings growth estimates since that time have been on a steady uptrend with a 12-month forward expected earnings growth of 7.42%. "Since hitting a peak in negative EPS guidance in Q4 2013, companies in the S&P 500 have issued fewer negative EPS preannouncements and more positive EPS preannouncements for the second consecutive quarter. 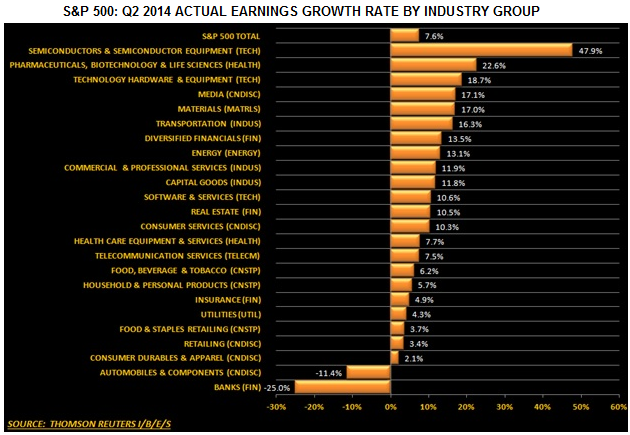 For Q2 2014, 84 companies have issued negative EPS guidance and 27 companies have issued positive EPS guidance. The number of negative preannouncements is below the record high of 95 set in Q4 2013, and the number of positive preannouncements is above the record low of 17 also set in Q4 2013. 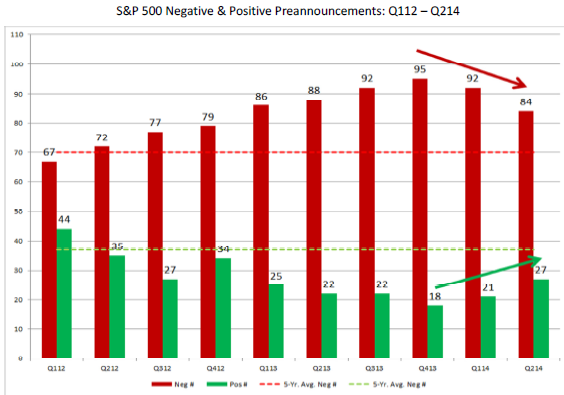 If these are the final numbers for the quarter, it will mark the lowest number of negative EPS preannouncements since Q4 2012 (79) and the highest number of positive preannouncements since Q4 2012 (34). (emphasis added)"
"New orders, as they are in Markit's manufacturing report released earlier this morning, are the key highlight of the ISM report for June, overshadowing the headline composite index which held steady at 55.3. New orders rose 2.0 points to a very strong 58.9 which point to acceleration for general activity in the months ahead (emphasis added). Production, at 60.0, is already very strong as are imports, at 57.0 for a 2.5 point gain." 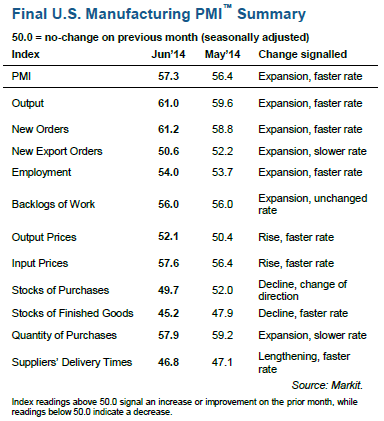 Below is a table outlining the various categories of the Markit PMI report and notable is the fact most of the categories are expanding. Much attention will be focused on the non farm payroll report and the Jobless Claims report, both released before the market open Thursday. The ADP employment report released today noted payrolls came in at 281,000, far above the consensus 213,000. Beyond the fact an improving employment market is needed, growth in jobs has large positive implications for economic growth. 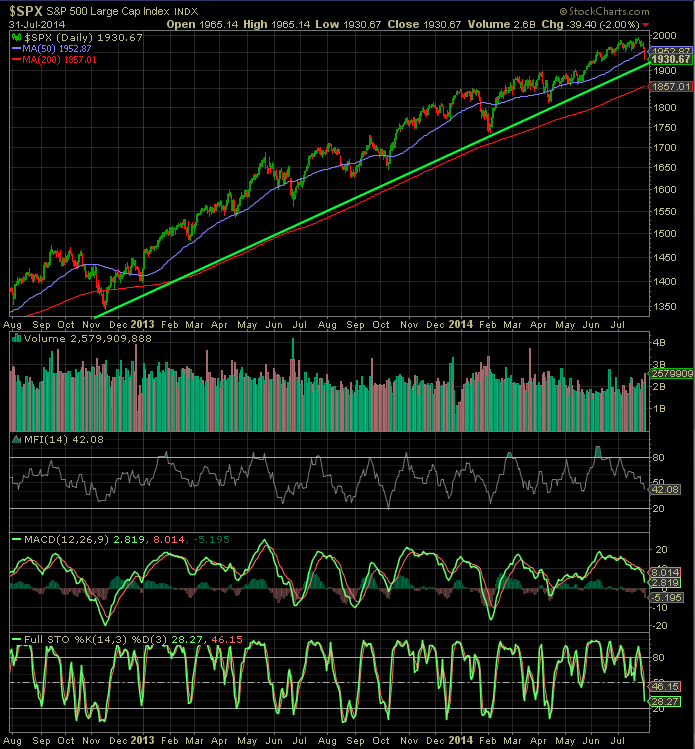 Certainly this market will not continue to move higher in a straight line, although it seems to want to do so. In an article by Dragonfly Capital titled, The SPY Is NOT Extended and May NEVER Pull Back, the author provides "technical" data that suggests the market is not overbought. From a contrarian standpoint, the more articles I see of this nature, the more I sense a pullback or correction is closer to occurring than not. A correction will occur and the timing is not predictable. However, if a correction does occur, fundamentally, the economy does seem to be growing, albeit below its long term potential, and this would be an environment that is still supportive of longer term positive equity returns.